Arran aromatic toiletries. Tea/coffee facilities with home baking. vanity unit. Luxury linens/towels. Tea/coffee facilities with home baking. I pod docking station/Radio/Alarm. Osprey was completely renovated in 2017. This is a large spacious superking or twin room with comfortable armchairs. The bathroom has bath with pressure-fed rain shower. Luxury linens/towels. Tea/coffee facilities with home baking. I pod docking station/Radio/Alarm. station/Radio/alarm. Freeview TV and complimentary Wifi. 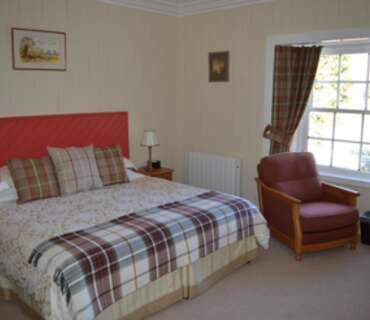 Macdui is a lovely bright cosy double room with a shower en-suite. Quality linens/towels and Arran aromatic toiletries. Tea/coffee facilities with homemade cakes. I pod docking station/Radio/alarm.